Read or Leave Reviews for Davis & Davis. We are including links to review us on Google, Facebook, Yelp & Angie’s List or to write a review to be displayed on this website. Professional and courteous. They were able to fix our heat on the first visit. My coil had been leaking. There wasn’t any cooling air coming out. Not good for when the summer comes around!! I called Davis and Davis and they were able to fit me in immediately and install a new coil. I had DnD service my furnace. Good job and good price. Tom was great. He replaced the motor and got it working ASAP. Friendly technician – very informative – and came on time. Thank you. Great company. We had a furnace installed and they gave us a better price than most companies. Also, very professional and knowledgeable. If you need a new system, you’d be remiss not to contact these guys first. Hired them to install a new heat pump and air conditioner. Did a great job, would recommend them. Great installation at a fair price. Awesome work with great pricing! Much better than the previous company we used. Walter was great. New furnace is great! 5 stars! Needed all new systems, these guys took care of it all. Awesome, timely and on point! Great company that I've had the pleasure to work with for over 10 years. They never disappoint! We called when our furnace went out and the temp outside was 20 degrees. They gave us a window of time for that day and Dennis showed up a half an hour later, diagnosed the problem(s) in five minutes and repaired everything within an hour. Thank you! I wouldn't use anyone else. Thank you!! As the hot weather came upon us, our A/C stopped working. (We hadn't used it yet this year, and had some trouble with the thermostat.) Dwight came out and in short order, our A/C is up and running! I would like to highly recommend your serviceman Henry. He was prompt, efficient, friendly, and tidy. He quickly installed a filter (that I have done myself with great difficulty) and wiped everything clean before and after. He was so interested in a kit that I had bought on line for my Aprilaire filter. It included the pink insulation for the sides of the filter. He had never seen this before and said that his customers were often upset by ;the filth of these parts. It was great to find a serviceman so pleased to do a good job. Send Henry back for my next checkup! Great guys, well done work on my system. Top notch service. Very professional! Did a great job, highly recommended. Setup very quickly and did a perfect job. Highly recommend. They did an amazing job on all my systems. I highly recommend them for any kind of heating or air – conditioning work. Extremely professional, quick, efficient and thorough!!! Highly Recommended!! This company installed our furnace about 16 years ago and we were impressed since Kevin, the salesman, did not advise us to buy a more expensive unit. Now, after 16 years, our AC stopped working, and we were prepared to replace and perhaps spend nearly $4,500. But, Kevin called! He told us he had looked up the serial number of our unit, recalled selling and installing it for us, and recommended that we repair it rather than replace it, for under $1,000. He said doing so would probably give us another 4-5 years of service because he was familiar with the reliability of the unit. WOW! He just saved us nearly $4,000. They have been doing our annual maintenance in summer and winter and have always been on time, professional and reasonable. Can't expect better service or honesty. Service was fast and reliable, and did a great job in our home! Very nice group – everything was kept cleaned. Great communication. A real pleasure to do business with. Highly recommend!!!! They redid our HVAC system and everything is nice and quiet. Outstanding job. Terrific service! Really professional. I had a problem at my house where my water heater was only work intermittently. The guy showed up and took the time to explain to me what the reason was and how he got it working. I recently had them out at my home. The installation was done at the exact price I was quoted and feel like the price paid was well worth it. Thank you so much. Good, good company. These guys came very quickly. They installed the furnace in no time & the price was good. Thank you guys, I will use you again. I definitely recommend their service, work was done fast and the prices were excellent! THANK YOU FOR THE WORK AND CALL!!! The company was very nice, and worked with our schedule. They came highly recommended from a couple friends of mine. I called them and they came quickly to see what was wrong and then back again with the ordered part. I will definitely use you guys again. Thank you for the great work. After being told by several other HVAC companies that our heat pump was shot and needed to be replaced, Davis & Davis diagnosed it as a stuck TXV valve... this was a quick fix and we were back on track. Kudos to D&D for being willing to dig a bit deeper. When we get to the point of needing to replace our heat pump, D&D will be at the front of the line! Install and service was wonderful, they were great! I give them 5 stars! We called them just after new years for a heating call. Within a few hours they were at my home. They cleaned up before walking out & repaired the unit in no time. Prices were hefty but they were a pleasure to deal with. Heating repair proved to be a positive experience that Davis and Davis was able to fix. I recommend not wasting your time and just call them up. Haven’t found anyone else better. Everything well. I love Davis and Davis! Marvelous I will call when it is time to replace the heater. Great and they are so polite! I appreciate everything they did, while being so kind and professional. A bunch of hard workers with good manners! Polite, calm, friendly men. Quiet but efficient, pleasure to deal with. Super work! Guys showed up and seemed well educated in their field. Thank you. We haven’t really had any very dry days since the install so I can’t tell how well it really works but there have been no problems or leaks. The whole installation was just great. Company was very honest, straight forward, courteous and professional. I think they provided a fair price and I look forward to working with them in the future. Davis and Davis was very efficient at telling me what needed to be done during the installation process. The men got the work done quickly and my furnace works just fine. New equipment= good. Workers= good. Efficient and personable. Good service and friendly staff. You can't go wrong by call Davis and Davis for your heating and cooling. Working excellently, thank you. The new furnace took a little to get used to but its working just fine. I would give 10 stars if I could. Very professional when I use them. A little expensive by I’d rather pay more for great customer service. I had a great experience replacing my whole system. The installer was Roberto and his helper (didn’t catch his name). Both of them were very professional, got here early; put down rugs to protect the floor and did everything very carefully. Good guys and did a well-done job. FROM THE BEGINNING I’ve been very happy that I chose DAVIS AND DAVIS. Simply because they are the best. Great and very responsive!! Solved my problem in the first visit. Jorge and Danny recently completed a job on my home. They were very professional, respectful and courteous the whole time they worked on my home. On one of the coldest nights of the year (or really for the last several years! ), I needed a heating repair company to fix my furnace on an emergency bias and these guys came out a couple of hours after I called He did a great job. Good – coordinated with my time, very convenient for me to not have to stay home the whole day just to wait for the man to come. Walter was thorough, patient in answering my questions and took care of the issue. I know that this must be a crazy time, so I appreciated the attentiveness and customer focus. Thanks! 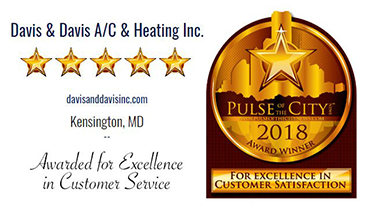 We have been Davis & Davis customers for many years, and they have done an excellent job taking care of routine maintenance for our heating and air conditioning systems every season. Last night was the first time that we needed them for a true emergency - no heat, and it was 10 degrees out. We called at the end of the business day, expecting that we would have to wait until the next day for help. Nope. D&D scheduled an appointment that evening, and Henry stayed after hours to help get our system up and running again. D&D stocks common and uncommon parts on their vans, and not surprisingly, we needed the uncommon part. They had it. Our service tech Henry was awesome. Friendly, great guy. Even taught me about the system as he fixed it. I enjoyed the company almost as much as I enjoyed the heat! This is five star service at its best. Great techs, parts in stock. Reliable. There when you need them. Highly recommended. Davis and Davis came on time and left everything spotless after finishing. The work (leaking water) was taken care of excellently. It is now working just fine. Always had good experiences with the staff. We had a great experience with DnD hvac as always. The boys were thorough, got the work done quickly and the lead man’s customer service skills were great! Once again, Davis & Davis comes through with a terrific installation. The four men who came to install our new upstairs furnace worked continuously to remove the old unit and install the new one. Each was professional, and extremely neat. They cleaned up everything when finished. This was the second complete install we have had and I can't say enough good things about the quality of the work Davis & Davis and their staff does! Gave me an appointment quickly, called to confirm with me that morning, and solved the issue that day. I’m happy with the service and I will definitely recommend! Our heating pump was spraying water all over the basement one evening (a part had broken), and Thomas came out while they were having their office holiday party and fixed it right away. It was a cold night, so we especially glad they were so quick and helpful. USE THIS COMPANY!!! They replaced a thermostat a little over a month ago and while we weren’t positive that the cheap fix would still be enough, I’m happy to report that we’re still warm!! The installation I received was wonderful! Very friendly and cleaned up after the work was completed. Great job. Excellent. Professional, timely and effective! Highly recommend! Davis & Davis sent Eric H who came within the time range provided to me. Cost was lower than expected. We have heat again after two nights during the coldest winter temperatures in decades. Have been using Davis & Davis for about 10 years now and will not go back to the other DC companies. Good job D & D! Reacted quickly and had a humidifier installer available about a week later. Very responsive, and super nice! The new heater is a little noisy but it’s been really cold lately so I’ll keep an eye on it. Loved the service. Our heating system broke and the technician came within two hours. Had all spare parts with him and fixed it in no time. charged us a very reasonable fee. The HVAC went out and we were out of the country. We had people at our house and they were hot. We had to arrange everything from Italy with time differences and lack of consistant phone and internet service because of where we were. We decided to replace and not repair due to cost and age of unit. We also had another company look at it and D&D was a better price and I had used them before and was very happy with them, so we chose D&D. D&D was very kind and loaned out an portable AC so there would be at least one cool room until the new HVAC we decided on arrived and could be installed. The staff tried their best to keep us and our guests up to date on the status of the schedule and during the install. They were actually able to get it in about a week earlier than estimated. They installed the unit while we were still away and I must confess, I was a little worried about that. When I finally saw the install, I was very happy with it. There were a few bumps after the install, but they were all over it. Office staff and apparently the techs were all kind and easy to work with. They made a big problem, much easier to handle. I've been a customer since 1993 in two different homes. They've always treated me right, never recommended anything that was not in my best interest, always kept the equipment in top condition. My units lasted longer than expected, but when they did give out, Davis & Davis offered the best deals on replacements. In my experience, they do exactly what they say they will do. The staff is professional, and a deal's a deal. You cannot do better. Well I woke up on the morning the storm in the DMV was to hit and we had no heat. I called Davis and Davis and they came within an hour and had us up and running. The gentleman serviced the unit and replaced the igniter switch.THANKS DAVIS AND DAVIS will be calling them to service my AC in the spring. Had an issue with thermostat not working. Easily scheduled them to come out and look at it. Problem was actually very easy to fix (water drain was plugged up and tripped the overflow switch) but technician did some basic tests and even looked into another problem I was having, completely unrelated to the original problem. The technician fixed that too, and all this in 1 hour. Very pleased with service. Enjoying my new HVAC unit! I'm VERY impressed with Davis and Davis Air Conditioning & Heating. They arrived on time, were super knowledgeable, worked quickly, efficiently, accurately and the head guy even made my cat Dixie purr! :-) Yes, they were a bit more expensive than the other guys, but you really do get what you pay for. I want to shout out a big thank you to the Kevin and the Davis and Davis team who helped this past week during this extreme heat. Altough you were alrady exremely busy you found time to fit us in to the schedule and everthing was fixed the same day. Many Thanks! We have been buying a service contract from Davis & Davis for 8 yrs to service a 16 yr old HVAC system. The same Service Tech has reviewed our system each Spring & Fall : Ivan kept our old system running. So when it was time to replace, we got several estimates, but were well taken care of by the high quality people at Davis. They are dependable & up to date on their technology. Davis & Davis installed a beautiful Lennox system & we know they are a sure bet on our home temperature systems! My family and I definitely recommend them! We had a dying furnace this winter, and our normal hvac provider couldn't come out for a couple of days; so we looked for another company in our area. Davis and Davis sent someone out that same day, and the technician discussed our options on repairs or a new furnace. We opted for the new unit, and had it in and running the next day! My family and I definitely recommend them!